Here in the Gauthier family, we have a young relative who is fond of a particular kind of book, and I've got him pegged. I always have some specially selected library books here for him. Now, he always rejects them in favor of books he brought with him, books which lean toward being about trains and trucks. Not that there's anything wrong with that, but, come on. Trains. Trucks. Needless to say, I don't get him those things. I can't read train and truck books. Yikes. No, I get him what he really wants to read. His favorite books, though he may not know it, but lucky for him, I do, are hidden picture books. The last time I had one for him, he kept insisting he didn't want to read it because he had five train books lined up for reading. Then I waved a page in front of him and finally caught his attention. 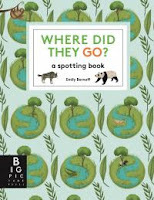 And once we were reading Where Did They Go? A Spotting Book by Emily Bornoff, he forgot about trains and trucks. For a while, anyway. Every two-page spread involves repetition of some natural element, and hidden among them is an animal described in a short text. Sooo much better than trucks, and better, even, than trains. We've all been in poor Polar Bear's position, hunting madly for underwear. 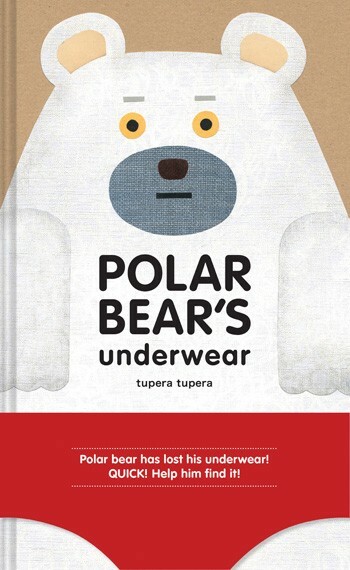 In Polar Bear's Underwear by Tupera Tupera, readers get to look for his underwear, by which, of course, I mean underpants, too. This is one of those deals where you find underwear for everyone but the polar bear whose underwear you want. You go through a lot of underwear in this book. These two books made for some great reading. Then I had to go back to trains and trucks.